Another year, another round of birthday cakes. November is usually a tricky month for me – in the past, I’ve made 3 cakes within two weeks for birthdays but with people moving to other cities, etc. I believe I only have one for the first half of November (the second one will be spectacular – watch this space). 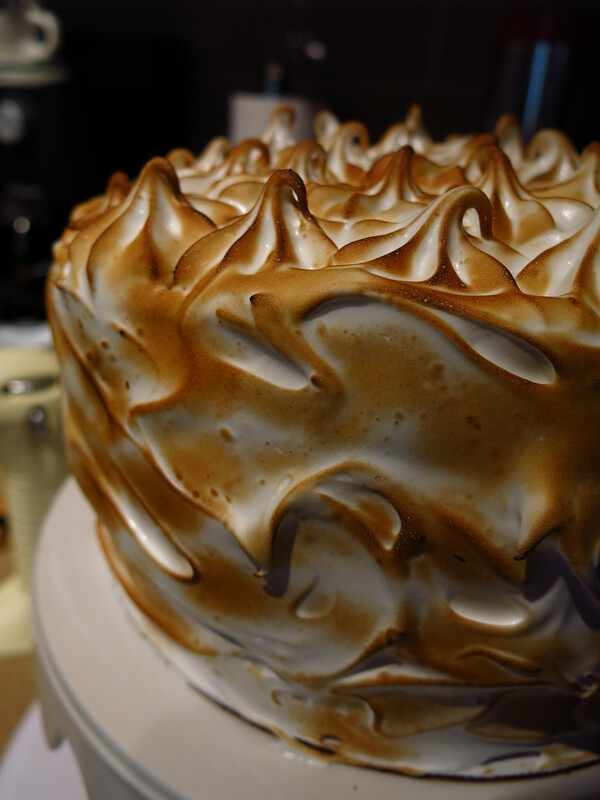 For my friend Liz’s birthday, I decided to make her a S’more Cake from the Smitten Kitchen cookbook. Amazing cookbook! Amazing author! And amazing results! Underneath that marshmallow-style frosting are three layers of graham cracker cake that sandwich a dark chocolate ganache. The graham crackers are ground into a fine powder and mixed with regular flour (that’s unbleached flour to you!) to make this beautifully coloured and flavoured cake. The chocolate ganache was made with a 60% dark chocolate, which was a perfect ‘non-sweet’ complement to the sugary frosting. One thing I learned on the fly: even though chocolate ganache can seem runny when you spread it, a quick chill in the fridge will firm up the texture making it very stable in terms of cake structural integrity. The frosting was similar to a 7-minute frosting – basically a heated sugar syrup whipped into egg whites. In the background (on the left) you’ll see the accomplice to my creation – the blowtorch! I have had mixed success with it and really wasn’t sure if it would perform on command. It still doesn’t function perfectly – I had numerous flare ups where I was literally (and very carefully) handling yellow flames. But for the most part, it worked. As I always try to do, my previous failures had taught me to put the heavy cakestand on the turntable, ensuring that I was able to quickly move the cake around and maximize the torch’s effectiveness. Unfortunately I didn’t capture a picture of the presentation but I made a small decoration of a real s’more (long skewer through a marshmallow, sandwiched by a touch of ganache and graham crackers) with a “Happy Birthday Liz!” sign affixed to it. It was jauntily placed on the cake with 5 gold candles (found them in the grocery store – score!). 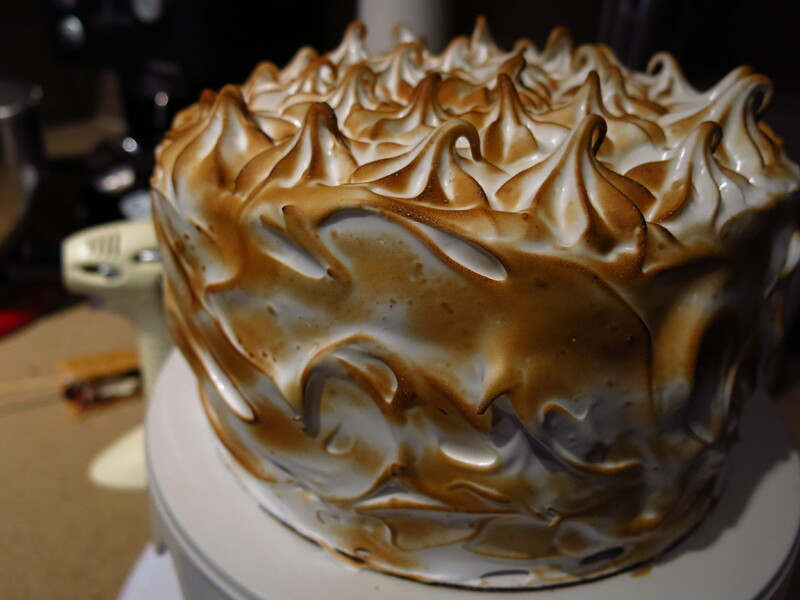 I’m thrilled that this cake turned out so well…and might I say, so beautifully. Definitely in my Top 5 so far. 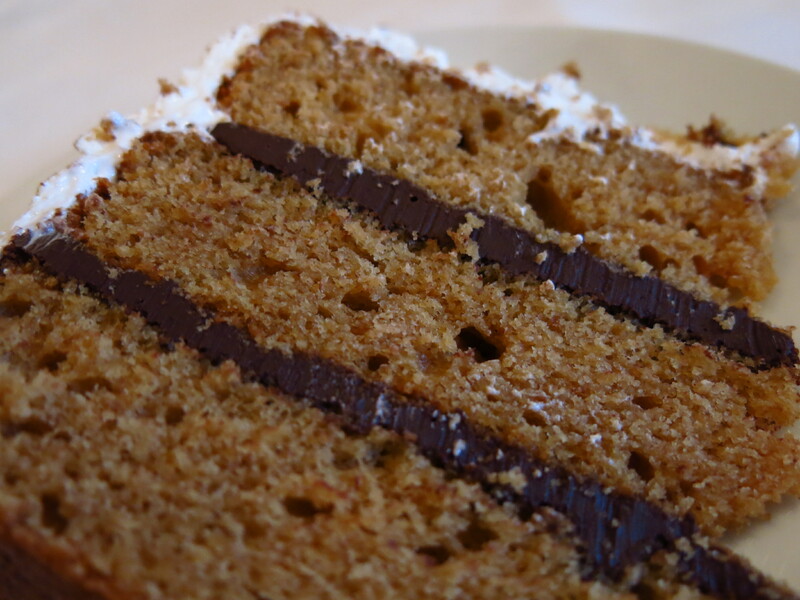 I would’ve liked to soak the cake in some kind of liqueur for a bit more moistness, but what goes with graham cracker? Maybe a cinnamon-vanilla syrup?